Profits, Oppression, and Manure Pies | Mises Christ! A few weeks ago, I was invited to a Facebook group that is intended to function as a place for debate between capitalist and communist anarchists. As one would expect, all the familiar communist tropes are present. In accordance with the Zeitgeist of our Occupy Wall Street era, they all upbraid the inherently oppressive nature of capitalist labor relations. This graphic and ones similar pop up with some regularity and their message seems to be a central claim of socialism past and present: Capitalists buy labor from workers at a certain price and sell the products of their labor at a higher price. This difference in what the capitalist pays the workers and what he receives for the product is the profit, which the capitalist keeps for himself, thus denying the workers the full value of their toil. Profit, then, is oppression quantified—a numerical expression of the degree to which the capitalist has stolen from his workers. However, this argument always ignores the reality that capitalists are not always making profits. In fact, at any given time, a great portion of those who are buying labor are suffering losses instead of raking in profits. According to the U.S. Census, over half of all business establishments take such substantial losses that they go under and suspend operation before they reach their fifth birthday.1 If a business is suffering losses, then workers are actually being paid more than the value of their labor. 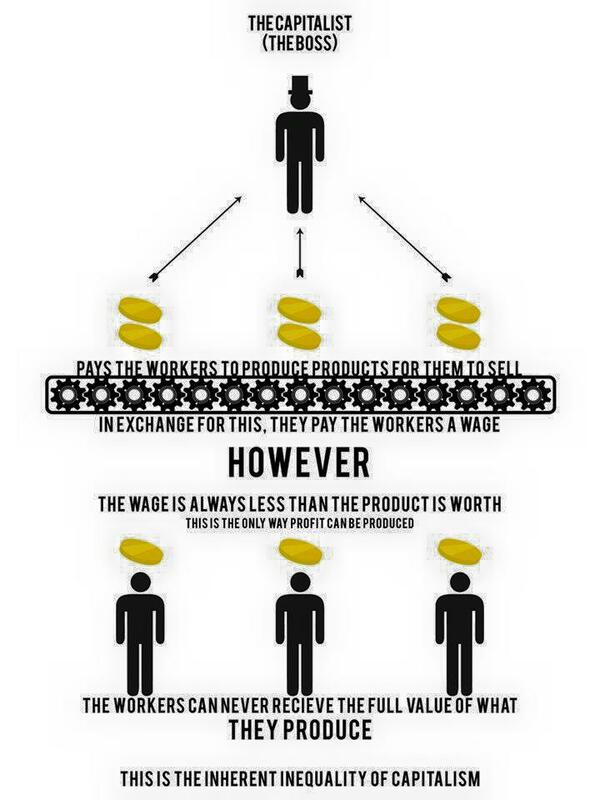 According to the logic of the aforementioned graphic, when a capitalist pays his workers five dollars for every widget they produce but finds out that the best price he can get for widgets on the market is three dollars, the workers must actually be oppressing the capitalist to the tune of two dollars per widget! Of course, this is a preposterous idea that no socialist would accept as cogent, but it necessarily follows from the logic of the labor theory of value that many socialists unwittingly evoke. In a post-1871 world, there really is no excuse for believing that products have objective value determined by the amount of labor required to produce them. Pies made with blueberry do not have the same value as pies made with manure just because they take the same amount of labor to produce. The macaroni sculpture that your little brother made as a Father’s Day gift (except in the eyes of his genitor, hopefully) has no value despite the fact that he spent more time and effort than did Michelangelo in the Sistine Chapel. Nickelback’s music is worthless no matter how hard they tried in producing it. Objects do not have value because they have been infused with labor; objects have value because people find them useful. Labor does not have value inherently and independent of consumption but its value is instead imputed by individuals’ subjective valuation of the good the labor produces. Diamonds have no value in Amish communities that eschew decadence, and neither does labor directed at mining diamonds. If the world has no use for a certain product, then it has no use for labor that creates that product—to wit, the product and the labor have no value. In an economy freed from government distortion of prices, a good’s value to society is the price it can fetch on the market. This is not all to say that oppression and dominance in the context of a marketplace cannot and does not take place, but if you accept that profit is tantamount to oppression, you must also accept all the nonsensical conclusions that logically follow from the labor theory of value. Revolutionary platitudes are not a substitute for economic literacy.